BPA stands for bisphenol A and is a resin used to make water bottles, food package containers, receipts, and more. Similar to phthalates, a product popularly used in cosmetics, BPA has been shown to interfere with ovarian development. 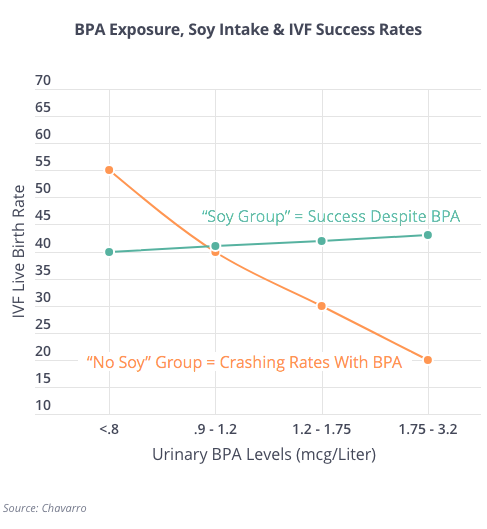 Studies run to understand how bisphenols and phthalates impact fertility have shown little association, but that may be masked by the benefits of products like folic and acid and soy. Let’s explain. When Dutch investigators looked at 900 pregnant women and measured their urinary levels of BPA and phthalate and compared it with how long it took them to conceive, they noticed something interesting: those who took enough folic acid were not delayed by bisphenol or phthalate exposure. However, those not taking enough folic acid experienced the detrimental effects. Researchers at Harvard did a somewhat similar exercise and looked the issue with IVF patients in mind. The Harvard team tracked 178 fertility patients undergoing over 230 IVF cycles and measured their BPA exposure by concentrations found in their urine. The team then stratified the results by those who consumed high levels of folate (through diet) and low levels. 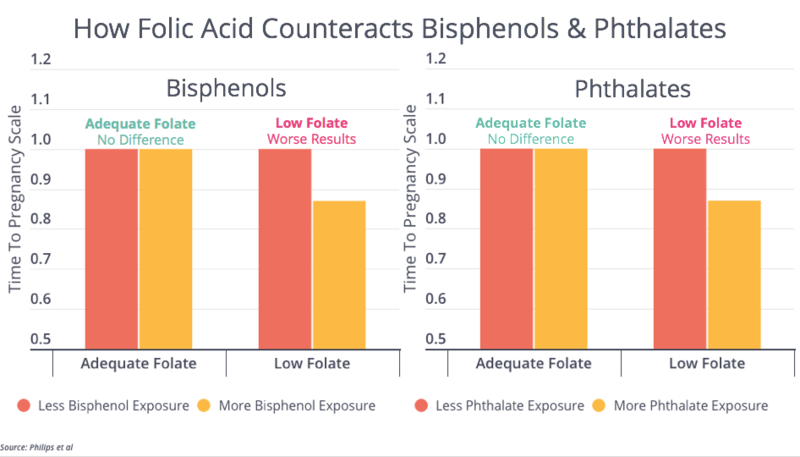 As you can see below, the group of patients who consumed less folate were negatively affected by greater BPA exposure. 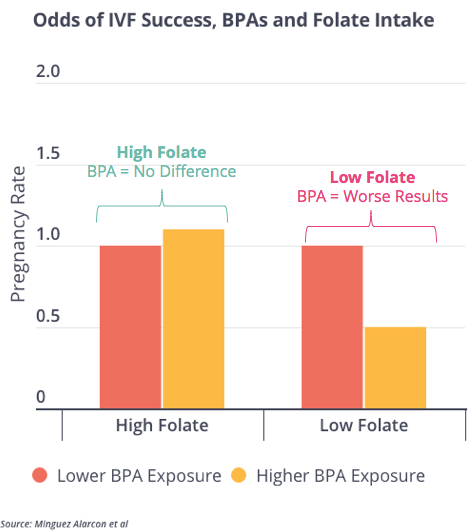 Those who consumed more folate witnessed no decline in pregnancy rates after increased BPA exposure. The same team did a similar analysis based on soy consumption and noticed the same phenomenon: those who consumed soy appeared more protected from the negative effects of greater BPA exposure. Ultimately, it seems clear that exposure to some environmental toxicants can damage our ability to conceive but that can partially be offset by intake of products like soy, folic acid and other nutrients.